O Allah, I seek refuge in You from the evil of my hearing, and from the evil of my sight, and from the evil of my tongue, and from the evil of my heart and from the evil of my issue. see Sahih At-Tirmidhi 3/166 and Sahih An-Nasa’i 3/1108. O Allah, I seek refuge with You from knowledge that does not benefit, from a heart that is not humbly submissive; from a soul that is never satisfied, and from a supplication that is not given a response. This is the du’a Shaykh Albani concluded his sitting with once when he was asked about the permissibility of video taping Islamic talks since one might think the video will have a greater effect (than audio alone). After responding that video taping also falls into that which is prohibited (excusable only by necessity or pressing need), the shaykh added an additional beautiful point of benefit–contrary to these videos (of people) being more effective, it is likely to lead to a disastrous consequence: that of callers becoming amazed by themselves and not benefiting themselves from knowledge. It is enough evil for a person (to be afflicted by), the shaykh said, that people point him out with their fingers [like celebrities]. The Importance of supplicating for steadfastness, and uprightness in the religion upto the end of one’s life. 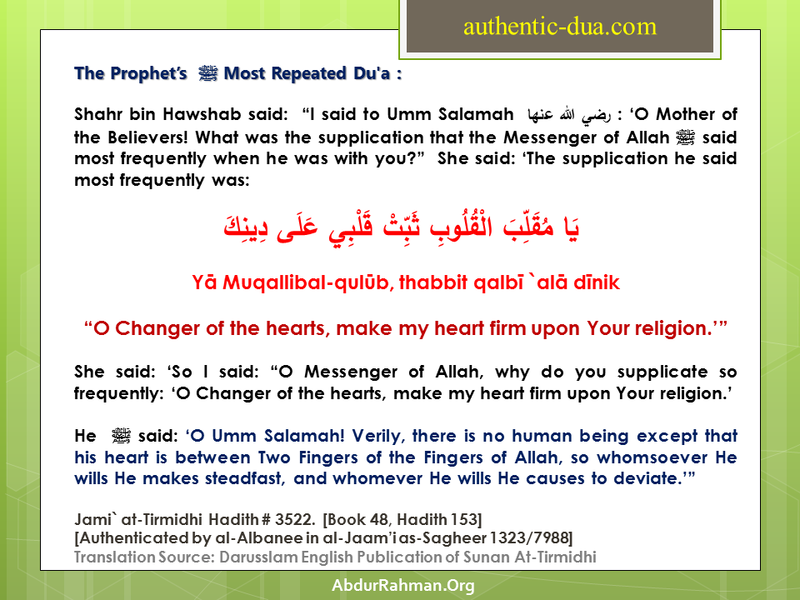 And also reported by Imaam Ahmad , from the hadeeth of ‘Aisha (radhiyaAllaahu anha): ‘The Dua’ which the Prophet (sallahAllaahu alayhi wasallam) used to supplicate with a lot…’ then she mentioned it.